Google Ngram Viewer: How has the English language evolved over time? Quick overview: How has the English language evolved over the last few years, decades, or centuries? Google Ngram is a free tool that searches through millions of digitized books and “graphs” out how English words and phrases have changed in popularity (i.e. – frequency of appearance in print) within the last 500 years. How can it be used in the classroom? Ngram is a neat way to start a class discussion around the use of similar words or phrases over any given period of time. Simply enter the date range you’d like to search (i.e. – 1800 to 1950) and enter a list of words or phrases, separated by commas. Hit the search button and see what comes up! What historical or societal shifts do your students think caused certain words to rise or fall out of fashion? Does adding or removing words build a better picture? Are you open to allowing your students to find and present their own unique Ngram findings? What are some examples? How has terminology for the on-line world changed in the last twenty years? Since when did we become a society with serial killers? What kind of road do you take to get to work? How are countries ruled? Are you really surprised? What decade did we think things were the most groovy? 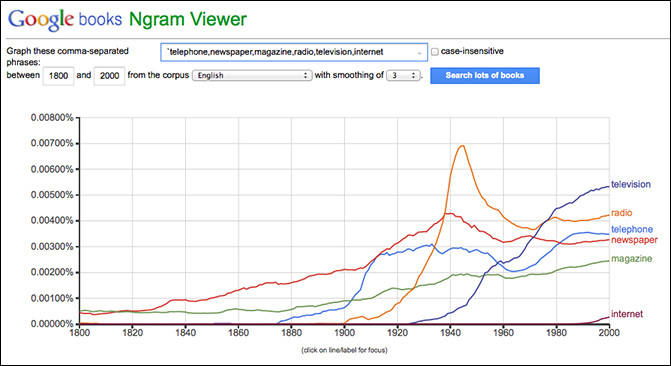 What have been the most popular forms of communication and media over the last two centuries? What about more advanced use? For those that are a little more adventurous, here are some tips to play with advanced search syntax. Benefits and Limitations: As with any tool, if you dig a little deeper, you may discover some inconsistencies. This article does a good job at explaining them. This entry was posted in Tools and Apps and tagged google ngram, ngram, word popularity. Bookmark the permalink.